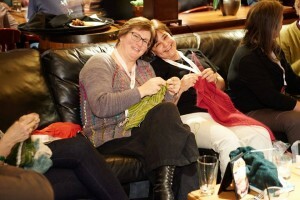 Home » Annetarsia Knits » Craftsy Instructor Summit – yep, I’m still thinking about it. 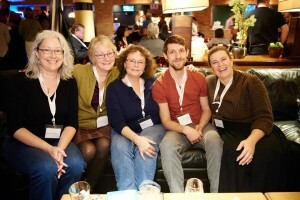 I’ve been home for a few days, and am still thinking about the Craftsy Instructor summit. I know that I am not alone, as our on-line Instructor forum is buzzing with comments, tips, ways to organize the immense amount of information, and implement ideas from the weekend. Craftsy instructors are unique in that they are not only masters at what they do, and experienced communicators, but they also are completely passionate about crafts, teaching and students. 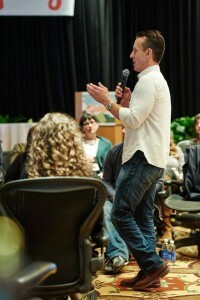 Craftsy lined up world-class speakers, and they threw a lot of information at us, and we lapped it up. One speaker noted that our group was unusual in that we weren’t leaving the room, checking our phones, reading the paper or chatting during lectures. Sure, a number of us were knitting/crocheting/hand-sewing, but that doesn’t count! 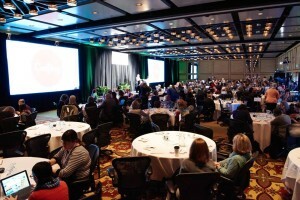 I attend a lot of conferences, and I count it a win if I get one or two new and usable pieces of information. At this meeting, pretty much everything was useful to me, inspirational, or both. All of us were inspired to do more, and continue to improve the student experience in our classes. Also, we got to know each other at meals and breaks, so there is a collaborative spirit that did not exist before. I was so busy that I did not take many photos, but here are a few that the Craftsy photographer took, during the weekend. I think they convey the large moments and the intimate ones that made up this special experience.